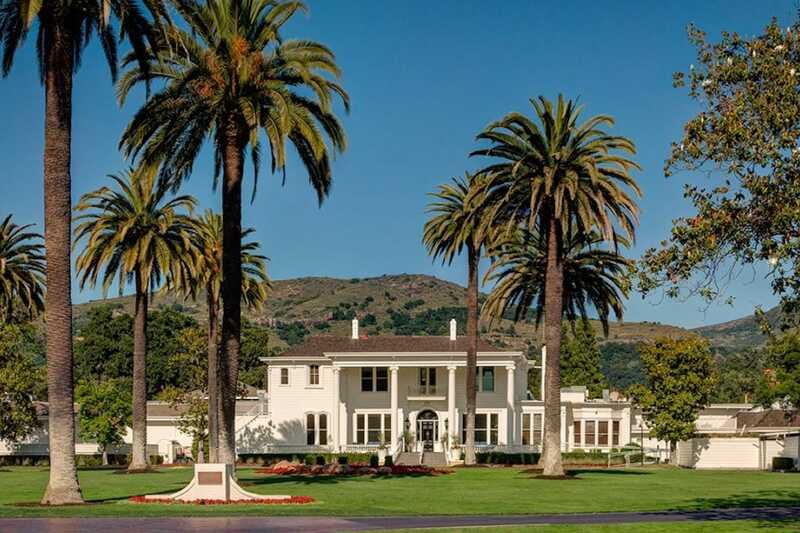 Let’s face it – between the vineyards, wineries, world-class restaurants, and beautiful hotels, planning a trip to Napa means you’re looking through a myriad of options, even if you’re coming on a day trip from San Francisco. 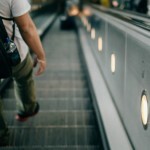 But lest all the choices lead you to decision fatigue, we’ve compiled some of our favorite places to eat, drink, and stay (and even an all-in-one option, for those who might be pressed for time). Presented by The Culinary Institute of America (the other CIA), the CIA at Copia is a place for visitors (and food and wine lovers) to gather and participate in a variety of programs and experiences, from hands-on cooking and baking classes, to wine-tasting classes (naturally), and panel discussions about sustainability in food practices. Then when you’re done learning, have a bite to eat. The Restaurant at CIA Copia is where all of that talk gets put into practice, inside the massive, open kitchen. The menu is seasonal and ever changing, but features such tasty gems as the Spicy Mussels and the Truffle Crespelle (an Italian-style crepe full of the delectable fungi). Itching to balance out all that wine tasting with some different spirits? At Morimoto’s, you can enjoy sake in Wine Country. Momosan’s Sake Bar, located inside the restaurant, is the only sake and Japanese whiskey bar in Napa Valley. Contemporary while still paying tribute to tradition, the menu is a happy balance of top-notch sushi options, as well as more non-traditional Japanese fare. Dining omakase (chef’s choice) when at a sushi restaurant, especially at one with such a reputable chef, is always fantastic. 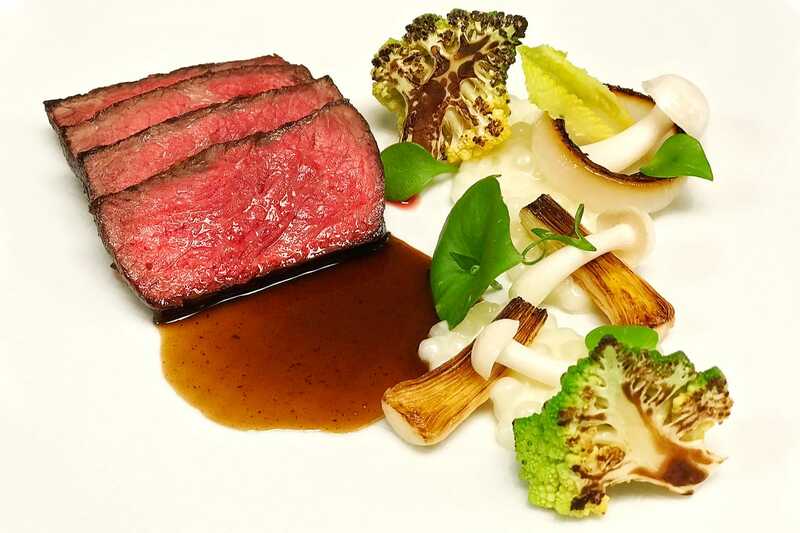 For the a la carte eaters, you’ll have to make the tough choice yourself of which beautiful dish to order, since, at Morimoto Napa, you eat with your eyes first. The Toro Tartare comes out unlike any tartare we’ve ever seen, with the ingredients plated as if on an artist’s palette, for you to dip, combine, and mix into a bite of your choosing. Pipettes of colored sauces come ready for the dripping on sashimi cubes, and the menu features such cultural blends as bone marrow with teriyaki sauce and five spice, sashimi caesar salad, and sea urchin carbonara. 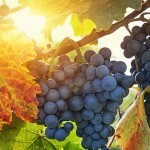 While delectable for your palate, Wine Country isn’t always the friendliest to your wallet. Sometimes, after some stellar vinos, you just want something low-key, familiar, and fabulous – without the price tag. Located in Imola, which just across from Highway 29 and a short drive from downtown Napa, In-n-Out is a staple burger joint for those who are familiar with California. We won’t get into the battle of the burgers (because all the burgers deserve love), but if you’re visiting from out of town, treat yourself to an inexpensive, delicious meal. Cheeseburger, fries (Animal Style, please! ), some extra banana peppers, and a Neopolitan shake. Doesn’t get much better than that. Consistently excellent, Chef Ken Frank’s La Toque has earned a Michelin Star every year they have been awarded in Wine Country. La Toque takes care to have something for everyone, with three different dinner menus offered nightly. 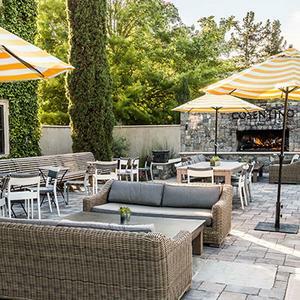 There’s the Core Menu and the luxe Chef’s Table Tasting Menu, not to mention the Vegetable Tasting Menu – an entire menu dedicated to those who want a delectable dining experience featuring only vegetables, many of which are from Napa Valley. Go green, anyone? Nestled into the rolling hills of Carneros, Cuvaison is a beautiful, sustainable estate known for its distinctive chardonnays and pinot noirs. Dedicated to producing vineyard-driven wines, Cuvaison treats each ‘block’ as its own little vineyard, harvested separately and made into its own batch of wine. The architecture is modern and without being intrusively so; you might feel like you’re the only person sitting on this wrap-around patio, sipping your wine flight and listening to the sounds of geese frolicking at the lake in the distance. 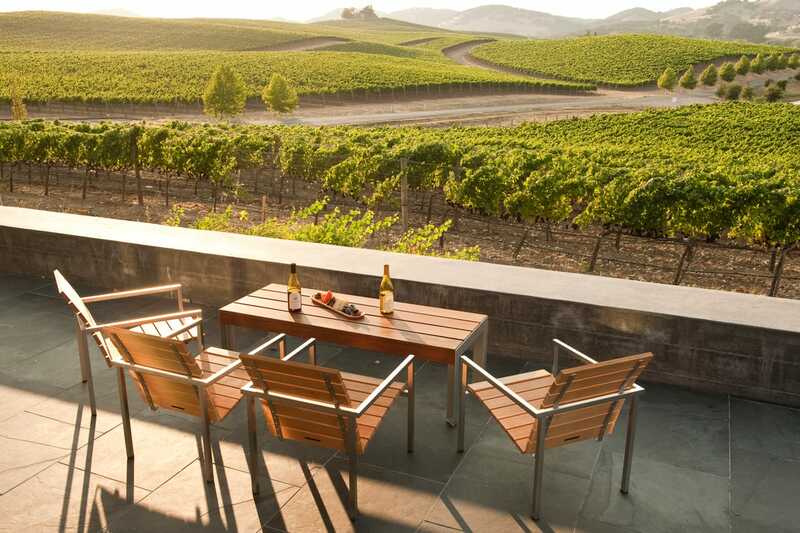 Enjoy the panoramic view of the rolling hills, and know that the wine you’re drinking and the views you’re seeing are all part of an eco-friendly, certified Napa green estate and winery. Tingle your taste buds with some bubbly from Domaine Carneros. You’d be forgiven for thinking you’ve just transported yourself to Europe, once you set eyes on the magnificent French château atop the knoll, surrounded by vineyards as far as you can see. Domaine Carneros is the stateside counterpart to France’s Champagne Taittinger and known for their sparkling wines ranging from the classic vintage-dated brut cuvee to blanc de blancs (sparkling wine made entirely from white grapes). For those looking for a fresh and vibrant tasting experience, Ashes & Diamonds’ contemporary approach to mid-century modern is just the ticket. With the bright pops of primary-colored decor, desert landscaping, and an outdoor fire pit, you might forget that you are in the midst of lush Wine Country if it weren’t for the Napa Valley wines – the ultimate blend of modern and old-school flavors, which “adhere to an ethos of light-handed winemaking and transparency of terroir.” Additionally, we swoon over the minimalist typographic bottle labels alone. At this sprawling hotel and resort, you can choose which distinct neighborhood to stay in, each featuring its own unique experience. The Mansion Estates and Cottage Drive will be more central, while The Grove and Oak Creek East provide more privacy and seclusion. Either way, enjoy the lush gardens, pristine pools and tennis courts, no matter which neighborhood you choose. With the regal colonial mansion amidst the California palm trees, Silverado Resort and Spa will transport you immediately to vacation. For the literary bed and breakfast experience, look no further than Poetry Inn in Napa Valley. This intimate inn boasts five beautiful suites that are charmingly named after revered writers, but do not sacrifice any modern conveniences. With spectacular views from each room, you’ll be able to soak in the poetry of Wine Country in ultimate comfort. 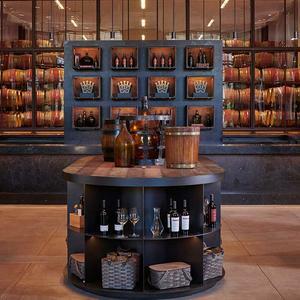 Book through WineCountry Perks and receive added amenities like a cheese board upon arrival, daily multi-course breakfast, and a tasting experience at Clif Lede Vineyards. 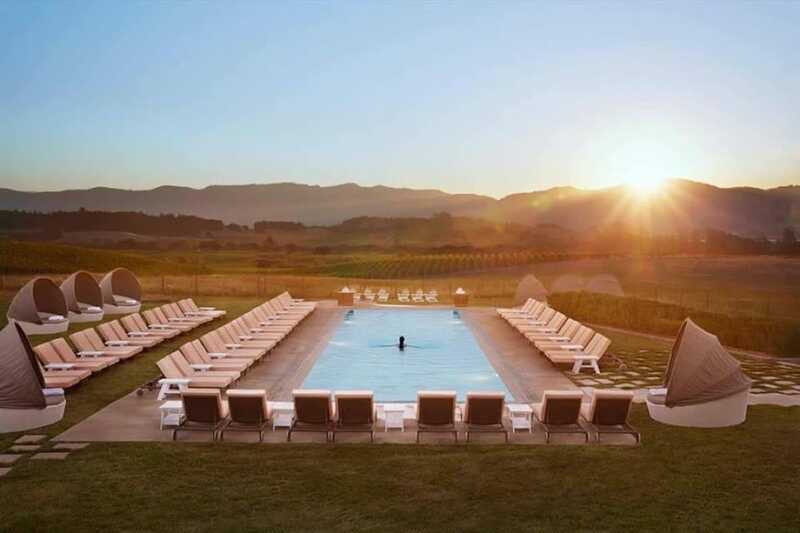 For the all-in-one experience, check out the offerings at Carneros Resort & Spa. Book the Courtyard Home for the whole family, or the Cottage with a view of the vineyard and a private outdoor patio. Or, if you’re traveling with several in your party, the Harvest Suite is two individual cottages with an adjoining patio, deck, and firepit. It doesn’t feel so much a hotel experience as it does a private estate stay. Treat yourself to a massage or manicure, or take a dip in the pool and soak in the sweeping views of this modern rustic estate. Getting hungry? No need to leave the premises. 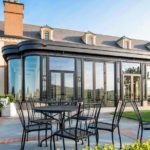 Save yourself an extra trip out with the car or limo by dining at the family of restaurants at Carneros. Everything at FARM at Carneros is a delight: the outdoor seating around fire pits, the gorgeous, vaulted ceilings, the hand-crafted cocktail program, dish after delectable dish from their dinner menu. The burrata is a mild, creamy beginning for your meal, punctuated with the sweet tang of grapefruit and garden onion. The truffle tagliatelle is a perfect proportion of umami and pasta, but is not to be outdone by the mushroom risotto. The smoked duck breast is always cooked perfectly and comes as a large portion, so be sure to make room for the dessert. If wait times are any indication, the Boon Fly Cafe is not to be missed. Lively and vibrant, the cafe serves modern rustic cuisine, and includes gluten-free as well as paleo options. The house-made donuts are a must have, but if you’re looking for something other than brunch food, fear not – the fried chicken and malt waffles are another crowd favorite.